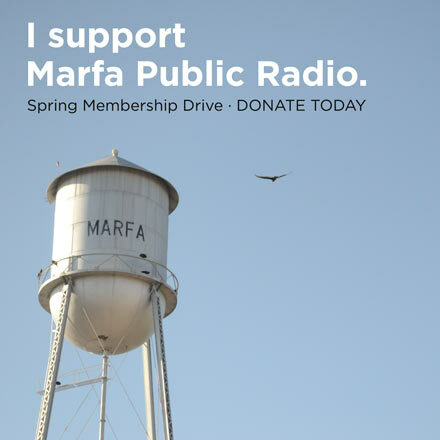 This is the second story in Marfa Public Radio’s series “Tipping Point” which explores tourism-driven development in Marfa and the greater Big Bend region. A couple of months ago, local officials announced Austin-based company C3 Presents was planning a festival for at least 5,000 people in Far West Texas. Criticisms about the potential festival — which C3 Presents is calling “Format” — started to crop up on social media quickly after the announcement. Soon after, a group of Marfa residents began a grassroots organizing effort against the festival. On a Tuesday night, Sam Karas — who is in part spearheading organization efforts — speaks to about fifteen people crowded into a small, dimly lit living room. She has only been in Marfa for about a year, but she worries about the potential effects a festival of this size could have on the town. Karas says this meeting was supposed to be a cautious celebration — for a short period of time it seemed like Format was dead in the water, when Marfa’s mayor announced C3 Presents had nixed their plans for a festival in 2020. Just a couple of days later, C3 Presents came out with a statement that said they’d heard local concerns, and wanted to take time to understand the potential impact to the region better. The company wrote that they would put off the festival for next year, but they still plan to move forward with the event. 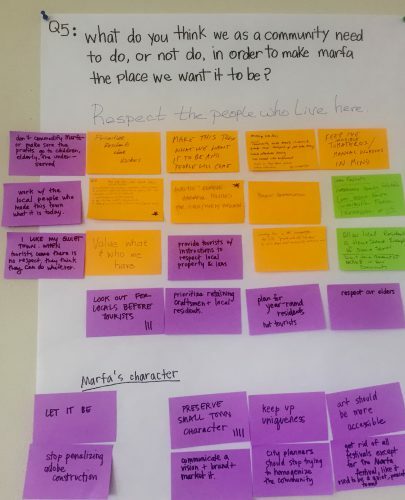 So instead of celebrating, Karas is back at the drawing board with the group, now called “Marfa Says No.” They’re getting ready for tomorrow’s county commissioners meeting, where local officials will discuss a first-of-its-kind permitting process for large scale events in Presidio County, like Format. The crew is figuring out a cohesive plan for what they’ll say to the court. Because the festival is set to be held on the private S. Gage Ranch outside city limits, permitting falls on the county. At the commissioners’ court meeting the following day, some fifty residents show up to comment on the agenda item. Several people implore the commissioners not to adopt a generic application process and instead take the time to craft a permit specific to Presidio County’s needs. Commissioner Frank Buddy Knight agrees and says he wants to see if it’s possible for the county to limit the overall scope of the event, including factors like the number of attendees and duration. The commissioners unanimously vote to table adopting a permitting process for mass gatherings and outdoor music festivals until they can do more research. They say they’ll also consider starting a citizens’ advisory committee on the matter. 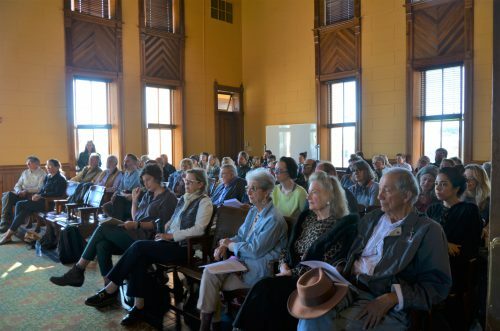 While the county commissioners heard residents’ concerns about the implications of Format, the City of Marfa is also thinking about the impacts of increased visitorship. At city hall, Terry Brechtel, Marfa’s city manager, is looking at a road map of sticky notes that say things like “limited festival size,” “vacation rental regulation,” and “historic preservation.” She’s in the middle of working on the city’s strategic plan, and these notes are all nascent ideas the city wants to consider for the future. One of the themes that have risen to the top — how to balance tourism with residents’ quality of life. Brechtel says tourism cropped up as one of the external forces shaping Marfa in the early working meetings. “Everyone knows that Marfa’s become a big tourist town, and now the C3 concert event is kind of putting a big exclamation point on that,” she says. C3 Presents is behind some of the biggest festivals in the country, like Lollapalooza and Austin City Limits. The company wants Format to attract a crowd of at least 5,000 people in its first year; a much smaller festival than the types of events the company typically produces. Yet, it would still be more than double Marfa’s population, which gives Brechtel pause. But with tourism as the backbone of Marfa’s economy, some think there’s positive potential here — a festival like Format could bring money to local businesses and Presidio County. C3 Presents contacted Vicky Barge, the manager at the Hotel Paisano, about room reservations. But things got complicated for Barge when she learned more about the scale of the event. Once the county adopts a permitting process, applicants — like C3 Presents — will have to get approval from the sheriff, the county health authority (which the county would have to appoint), and the emergency management coordinator Gary Mitschke. Mitschke, who is also Presidio County’s fire marshal, is especially worried about the possibility of wildfire — a constant specter for residents of West Texas. Peak fire season is in the spring, the time Format was originally planned for. Regardless of the season, he says “there’s not really a real good time to have something like that” because the region is so dry. “We kind of live on the edge of just having enough resources to take care of day to day needs,” Mitschke says. Presidio County only has 2 EMS crews, and small volunteer fire departments which can get overloaded quickly. 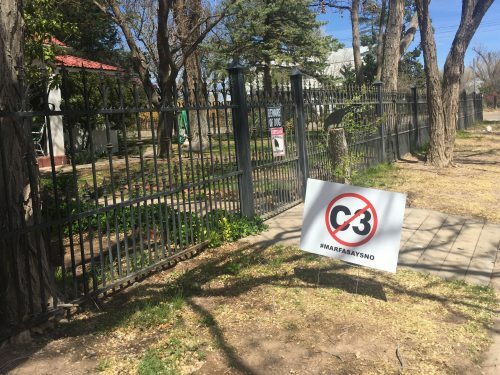 Mitschke says he’s heard C3 Presents would bring in their own fire and medical professionals, but their plans are unclear because he hasn’t yet had substantive conversations with the company. Mitschke’s concerns over health and safety have been echoed by elected officials, who say they’ve mostly heard from constituents who are worried about the scale of the event and its potential to strain resources and infrastructure. 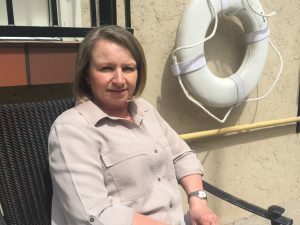 Retired Marfa native Dawn Shannon says she feels tourism has overtaken her hometown. Although she recognizes the role of tourism in Marfa’s economy, she thinks a festival like Format would be a strain. Resident Ann Dunlap also grew up in Marfa and has seen the town’s transformation over several decades. She thinks that instead of being afraid of change, residents can be involved with the growth that occurs. Dunlap’s not exactly pro-festival, but thinks Format is worth considering the benefit that could come with it. She says the city and county have the ability to plan for what happens, and that organization can help residents cope with having larger events. Exactly when that will happen is unclear. This entry was posted in KRTS News and tagged C3 Presents, Tipping Point. Bookmark the permalink.